The crustacean stomatogastric nervous system (STNS) is one of the most extensively researched neural systems in studying the effects of neuromodulation. Previous studies have reported the actions of neuromodulators on intrinsic neuronal properties and synaptic strength in the STNS , but little is known about neuromodulatory effects on the short-term synaptic dynamics. We investigated the effect of the neuropeptide proctolin on the dynamics of the inhibitory synapse from the lateral pyloric (LP) to the pyloric dilator (PD) neuron in the crab pyloric network. Synaptic transmission between these neurons consists of spike-mediated and non-spike-mediated (graded) components. The graded component of this synapse shows short-term depression in control saline, but in the presence of proctolin, low-amplitude (<30 mV) presynaptic stimulation causes the facilitation , while high-amplitude (>30 mV) stimulation causes depression. 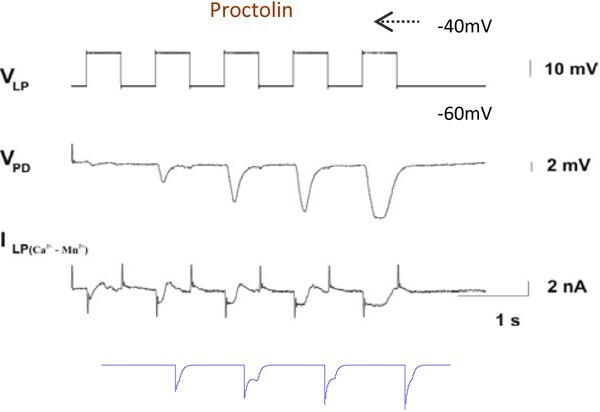 We built a model to explore the mechanisms underlying proctolin's effects on the short-term dynamics of the LP to PD synapse based on kinetics of Ca2+current in the presynaptic LP neuron for various waveform amplitudes. We model neurotransmitter release using a threshold in residual Ca2+concentration so that synaptic strength follows the changes in presynaptic Ca2+ concentration. The main effect of proctolin in this model is two-fold: First, proctolin slows down the activation kinetics of presynaptic Ca2+ current. As a result, there is a slow accumulation of free residual Ca2+ current in presynaptic terminal, which is consistent with the increased synaptic release seen in our experiment data (Figure). Second, proctolin activates a non-specific ion channel . We assume that this channel is permeable to Ca2+, suggesting that the baseline of background Ca2+ concentration in the presynaptic terminal is increased by proctolin. Together, these two effects are sufficient to explain the modulation of both spike-mediated and graded components of the synapse by proctolin. Effect of proctolin on dynamics of graded IPSPs of LP to PD synapse. Facilitation of the LP to PD inhibitory postsynaptic potentials (2nd and 4th trace) in proctolin is associated with the activation of a Ca-like inward current. The 2nd trace is experimental data and 4th trace is generated by our model. Currents in the LP neuron (3rd trace) correspond to inward current (presumably Ca2+).